3x10 Deflecto Contemporary White Plastic Register Discounts Apply ! Plastic registers are ideal for areas that might have a lot of condensation because they won't rust. These white vents are made of a mineral enhanced polypropylene making them very durable. The plastic floor registers can be used in new construction or in your current home. White vents are easy to install, they simply drop into place and lay flat so safety isn't an issue. Plastic registers have rounded corners and fins for a clean finished look. White vent floor registers work great in bathrooms or kitchens where you might get a lot of condensation. Because the plastic floor register faceplates don't get nearly as warm as a metal register, they are safer to use around small children and pets. 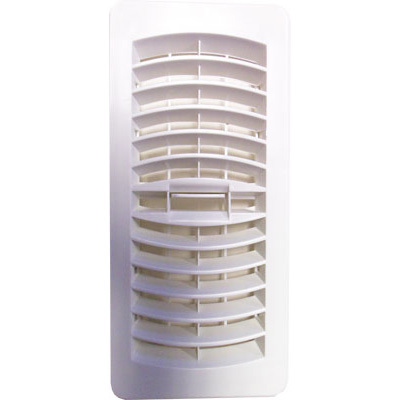 These 3x10 white vents can be used indoors or outdoors for all of your ventilation needs. Faceplate Size: 4 1/8" x 11 1/8" Drop-in Depth: 1 1/4"
Use these white vent covers throughout your home for a uniform appearance!